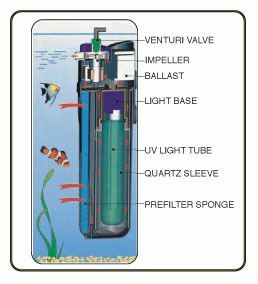 The JBJ Submariner is the proactive solution for eradicating harmful micro-organisms and unattractive green free-floating algae in fresh & saltwater aquariums. The Submariner is revolutionary! JBJ UV sterilizer/clarifier is completely submersible, which can be placed either in the main body of the aquarium or positioned horizontally in a sump for a clutter free set-up. The ability to adjust flow rates puts you in total control of what you intend to eradicate. Slower flow rates increase the dwell (contact time) period with the UV for more resistant parasites while faster flow rates are needed to rid undesirable bacteria and free-floating algae. We have also incorporated an adjustable swivel spout nozzle to add extra flow in your aquarium as a secondary benefit.